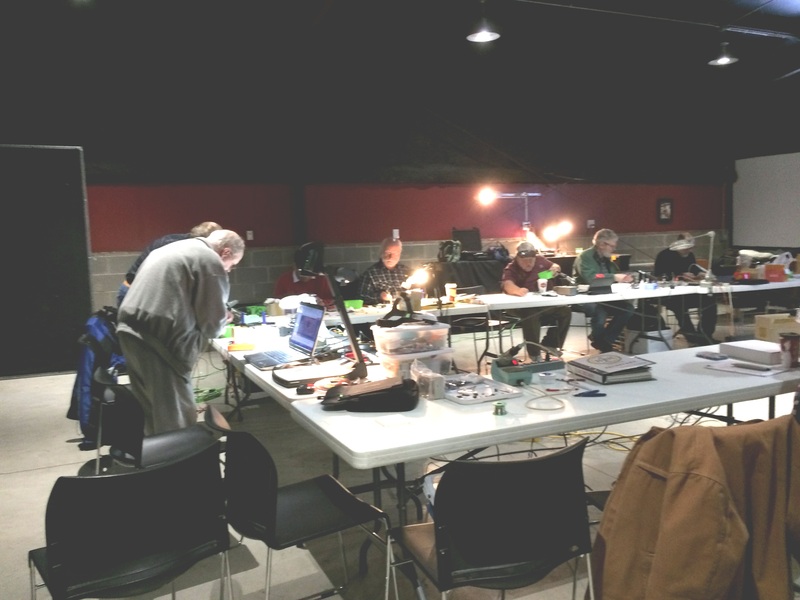 Huber Heights Amateur Radio Club – NO8I – Experience the Power of Amateur Radio! The Huber Heights Amateur Radio Club (HHARC), Call Sign NO8I, supports two repeaters located just north of the city of Huber Heights, Ohio. The frequencies are 442.950+ PL 118.8 Hz and 224.300- PL 123.0 Hz. The Huber Heights Amateur Radio Club welcomes everyone interested in Amateur Radio (whether licensed or not). Please feel free to attend our meetings. We formally meet every first Saturday of each month, except during the summer. The next formal meeting will be September 1, 2018. Informal meetings during the summer months will be announced. in “The Forge” building in the back. For more information on our club, Click Here for a link to a brochure suitable for printing and/or distribution. Click Here for a link to our Facebook page. The HHARC is working on building band pass filters. We held a build session on Feb 2, 2019 at The Forge from noon to 5 pm, after our regular club meeting. 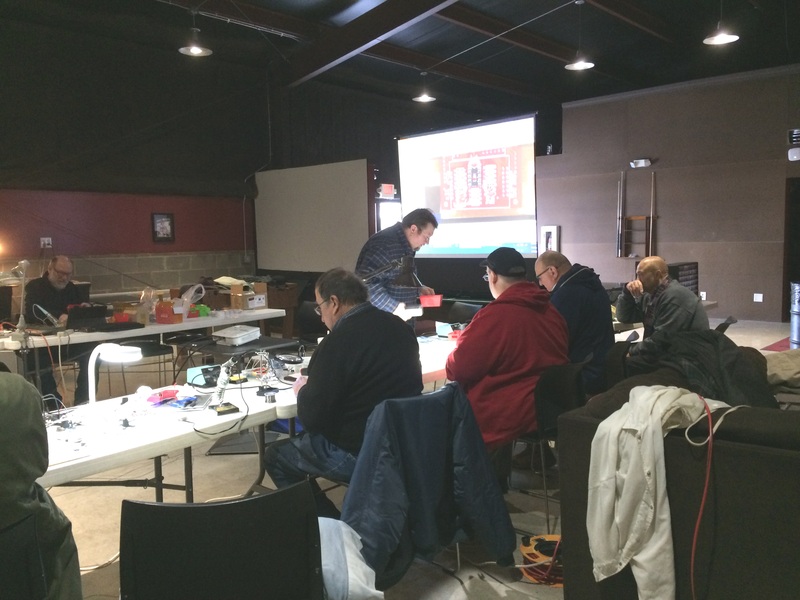 We held a second build session on Feb 23, 2019 at The Forge from 9 am to 5 pm and held a session on March 2, 2019 after our usual club meeting. Our last planned pass band filter build session will be May 4, 2019, after our regular club meeting. Some HHARC members gathered at “The Forge” to assemble “potato-gun” style antenna launchers. The HHARC participated in Field Day 2018, June 23 – 24 at Cottonwood Park, 6000 Fishburg Rd in Huber Heights. We operated as a 3A category with 3 HF stations on emergency power, plus a GOTA (Get On The Air) Station. Jim Storms AB8YK, President of the HHARC, reported that we had a record 9 different operators with 24 people attending. We made 265 contacts with an additional 12 from the GOTA station. We worked 41 states and 55 contest sections. Most contacts were on phone but we had 1 CW QSO and 59 Digital QSO’s. Our entered score was 336; with a power multiplier of 2 (for the digital and CW contacts) for 672. Bonus points were 950. The Huber Heights Star Spangled Heights Celebration was June 30th at Thomas Cloud Park. As in the past, the HHARC showcased the DARA Communications Van. The Van and other HHARC club exhibits were in the parking lot by the splash pad. The weather was very hot with temperatures in the low 90’s and perhaps, because of this, public turnout seemed to be rather low. Nevertheless, we had a good time. We wrapped up operations by 5 pm. Some HHARC members are participating in a club project build this winter. We are building an Arduino-based antenna analyzer similar to the project in the November 2017 issue of QST magazine. We held our final workshop for the HF version of the analyzer at the Forge on March 3, 2018. Club members Reuben Meeks, W8GUC, and Phil Brown, AC8UW, are working on an add-on for the analyzer that would take it up to VHF/UHF ranges. More on this to follow. ~~Spot the International Space Station! As the third brightest object in the sky, the space station is easy to see if you know when to look up. Follow the link to find out the locations and times to view the International Space Station as it travels past the Dayton, Ohio area. Click here to see the current position of the ISS. Start at the Ohio District 3 Readiness web page.